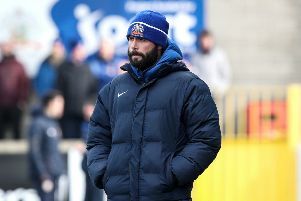 Dungannon goalkeeper Alex Moore believes the Swifts must win their three remaining games to have any chance of finishing seventh. The Tyrone side are locked in a three-way battle to finish top of their section. Glentoran and Institute are the other teams in the mix, with just three points between the sides going into the last fortnight. Moore said: “Our target is to finish seventh but we know we probably have to win all three of our games. Moore was named the sponsors’ man of the match as Dungannon claimed a 2-1 win over Institute on Saturday. With the game at 1-1, the Swifts were awarded a penalty when Michael Carvill’s cross was judged to have struck the arm of fullback Ryan Morrow. Institute were unhappy with the decision, but sub Paul McElroy kept his cool to convert the kick. Earlier, Jarlath O’Rourke and Johnny Lafferty had penalty appeals turned down. Moore added: “We could have had two or three penalties today. “Institute made it difficult for us but we stuck at it, showed our quality in the second half and got the three points. It was an eventful afternoon for Daniel Hughes, who gave Dungannon the lead and then departed with what looked a painful injury. Institute levelled when Ronan Wilson ran on to a mistimed back-header and finished coolly. But the big talking point was the penalty award for McElroy’s winner. Caretaker Institute boss Kevin Doherty felt it was harsh. “It’s difficult to take. It was a tough game and I’m not sure either team deserved to win it,” he said. “I’m just disappointed with the decision for the penalty. “Apparently it was the assistant referee who gave it, but he’s a long way away. Dungannon now face Warrenpoint and Ards over the Easter weekend, before finishing at Newry next Saturday. Swifts boss Kris Lindsay admitted they started slowly against Stute. “I think you saw that in the first half - it had the feel of a pre-season game at times,” he added. “It’s not really acceptable but it happens. “When we did up the tempo and play quicker, we caused them problems and we did that in the second half.